If this apartment is booked, please see my other two apartments on VRBO #'s 316323 and 816267. For 10 years I have been renting to many satisfied repeat customers. You can read a lot of great reviews at 316323. They are all at the Cove, a small group of beach front, ocean view apartments, just 200 feet from the ocean. This modern apartment serves as your home base from which you can explore the peninsula. Arrange deep sea diving and sport fishing excursions with The Dive Academy. You can snorkel at some of the most beautiful beaches, including Playa Rincon, Playa Las Galeras, El Valle, and Playa Fronton. Seasoned scuba divers can explore local shipwrecks. Come see the humpback whales breach out of the water, from January to March, each year, when they come to mate and have their offspring!!! In between you and the ocean is the pool, with a swim up bar. Grill local fish on the charcoal barbeque, or stay inside and cook in the full kitchen. 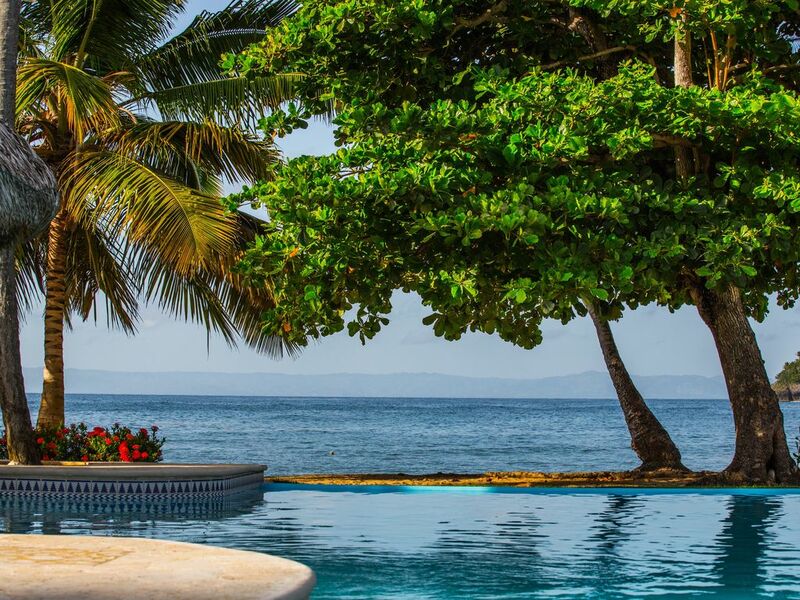 It features a view of Samana bay, and a private beach, only a few steps away. Since I own two other apartments, I can accommodate groups of up to 12 people. As I financial planner residing in Pennsylvania, I get tired of the long dreary winters. When touring the Dominican Republic, I fell in love with the Samana peninsula. We try to visit a few times per year, and we enjoy sharing the beauty of the island with other vacationers when we are not there. I loved the area so much, I bought three apartments. They are 316323, 816267 and 816268. Here you have the privacy and tranquility of a small beach, but if you drive a few miles, you can enjoy some of the larger beaches like Rincon or El Valle. All of the beaches here at the tip of the Samana peninsula are mostly undeveloped. You can enjoy a true Dominican meal at one of the rustic outdoor restaurants or bring your own cooler with some food and cold Dominican rum and Coke! The Samana Peninsula has many mountains which add to the beauty of the bay. The Cove was spectacular. We arrived to find a very clean condo with bottle water already there which was great after a long trip in. The staff who works around the property where very friendly and so helpful. On our first morning we woke to have a cold showers due to an issue with the water on demand but Coco fixed us up in no time, he is so helpful with anything. Carmon who is on the property was great as well and went to get us beverages while we settled in our first day. We had lobster delivered to our door on several occasions you just have to ask about it. We meet several owners who where in and other renters everyone was great and very friendly. We loved staying at The Cove. The setting is amazing! Unfortunately, the condo was not as well maintained as the complex. It seemed as if it hadn't been used for quite a while. The floors had not been recently swept and mopped and we felt grit under our feet as we entered even though we left our shoes by the door. The towels smelled of mold. The barbeque grill was pocked with rust and looked as if it hadn't been cleaned for a long time. We had to ask for a ladder to be removed from a bedroom. I can't imagine why it would have been left there. The closets were not well organized. The place just needed some love. Maybe it would help if the owner spent a few nights there. Unfortunately this renter never communicated this to me during her stay or after. We would have been happy to address any concerns. The staff had just installed a new air conditioner to ensure the apartment was comfortable, which may explain a small amount of dust on the floor. The apartment has beautiful, high, 9 foot ceilings, allowing better air circulation, so we typically leave the small step ladder in case our guests want to change the direction of the fan or air conditioners. I am not sure why someone would object to having a ladder. We had a long term renter prior to this guest's arrival, who had no complaints, and the apartment was just cleaned the day before, so I don't know how it could not be clean. We do stay in this apartment when we visit and we always bring new towels and sheet sets. As I mentioned, if the guest had contacted me, I would have been happy to address these concerns. Our guests enjoy grilling on the stainless steel barbeque grill on the ocean view balcony. It is only one year old. It started to rust after only two months. Yes it does have some dots of rust on it, but we are ON THE BEACH. Everything corrodes quickly on the beach due to the salty air, no matter what part of the world you visit. Last time we visited we put a fresh coat of stain and urethane on the wooden rocking chairs on the balcony as well as the interior doors. We also replace some screens to keep out the mosquitos. We also installed two new fans for those guests who do not like air conditioning, but would like good air flow. I wanted to address these concerns but the guest never responded. Maybe some people just like to complain. If you look at my other apartment's reviews #316323 and 816267, most guests love the Cove and the apartments. If there is ever a problem, I work with my guests to make it right. The apt that I rented from Patrick was absolutely fantastic! It was absolute paradise, absolutely beautiful. The pictures I took look like post cards. It was super comfortable very well kept. Everything was amazing! We felt safe with it being a gated residential and security being there 24/7. Coco was great, very welcoming and very attentive. Made my family and I feel right at home. Patrick was great giving suggestions as to some points of interest. We visited Playa Rincon amazing they also have a man grove and we also did El salto de Limon. Both close to the apt. There is also a close store where you can get minor things such as soda beer chips etc. Great to hear that you enjoyed Samana and the Cove! I look forward to having you and your family back in the Fall!